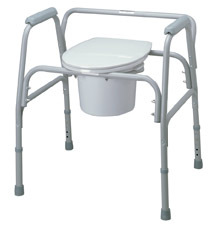 This Bariatric Commode has a back rail that removes quicky and easily for convenient storage and use. Features a durable, plastic seat with lid plus plastic armrests for additional patient comfort. Height adjusts from 19.5" to 23.5" in one inch increments. Non-skid, non-marring rubber tips provide extra safety. Includes 10-quart capacity commode bucket with cover and splash shield.28" base width; 20 1/2" overall base depth; 24" width between arms; 14" seat width; 15" overall seat depth; seat height: 20 1/2".650 lb. weight capacity.Limited lifetime warranty on frame. Six month warranty on handles, feet, seat & lid, push buttons, "wearable" parts.